Chat is available from 8:00 A.M. to 5:00 P.M., Monday through Friday. Click on the "Chat Now" icon in the navigation menu to get started! 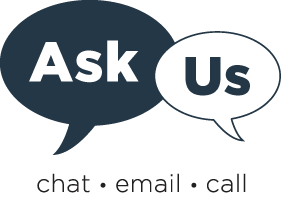 Ask Us is an e-mail service for requesting literature searches, reference information, or assistance in using information resources. Requests are filled on weekdays, normally within one working day (except for holidays and other campus closings). If you need immediate assistance, please contact the Library Research Services Office at 817-735-2070 or 800-687-5302. Ask Us is primarily for the use of current UNTHSC students, faculty, and staff members. Please be aware there may be fees associated with this service for non-UNTHSC patrons.